Intel have developed and introduced a new budget smartphone particularly intended for the African market, under the name Yolo. The Intel Yolo features a 3.5 inch 320×420 display and a 1.2Ghz processor, and has a pretty decent design. Also, there seems to be a modern version of Android, offering a few pre-installed apps which should actually do quite well to enhance the experience. 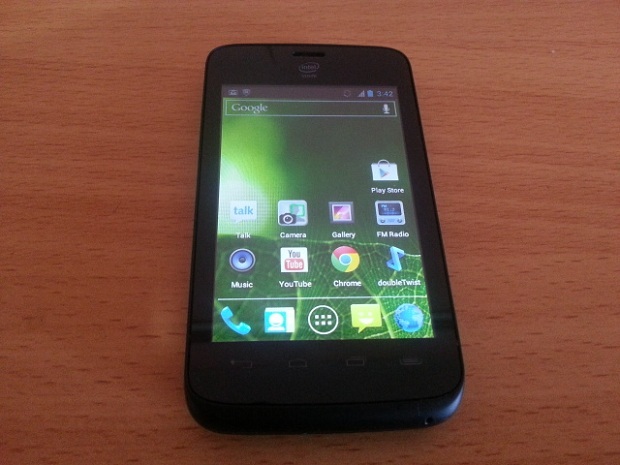 Kenya is the primary market for the new device, and will be sold for 10,999 shillings ( $125) by Safaricom. Read on for full press details. Nairobi, Kenya, 24th January 2013 — Leading integrated communications provider Safaricom Limited today announced the Yolo™ smartphone, the first smartphone for Africa with Intel Inside®. The phone is based on Intel’s latest smartphone platform for emerging markets, launched earlier this month at the International Consumer Electronics Show (CES). With Intel Inside, users of the Yolo smartphone are assured of fast Web browsing, impressive multimedia capabilities and a great Android* applications experience. The Yolo™ smartphone is based on the Intel Smartphone Reference Design for the value segment of the smartphone market. The device is powered by the Intel® Atom™ processor Z2420 with Intel Hyper-Threading Technology that can achieve speeds of up to 1.2 GHz. The efficiency of this technology package helps to enable a smooth and responsive user experience, which includes support for 1080p HD video capture, and a camera with advanced imaging capabilities, including burst mode that allows people to capture seven pictures in a second in 5-megapixel quality. The device is housed in a compact design and features a 3.5-inch touchscreen display for crisp text and images, support for FM radio and an expandable memory slot for greater flexibility, and HSPA+ modem support with Intel’s XMM 6265 modem for global roaming. The handset can also be enabled with McAfee mobile security software, providing consumers with added protection as well as data backup and restore capabilities when needed1. Safaricom provides a comprehensive range of services under one roof. This includes mobile and fixed voice and data services on a variety of platforms. It is Kenya’s widest 3G network with a growing fibre optic cable footprint and its most expansive WIMAX presence. Safaricom pioneered commercial mobile money transfer globally through M-PESA, the most successful such service anywhere in the world. Launched in March 2007 as a money transfer service, it now has over 15.2 million customers and over 45,000 Agent outlets countrywide. 1 *Device package includes information on how the end user can enable the free, limited 1- or 2-year License period.